We first looked at the GeForce 6600GT on AGP back in November, and since then we have seen a deluge of board partners bringing out cards based on the technology. When Tim concluded his feature on the reference board, he complained about driver issues and the low clock speeds on the reference board, whilst being impressed with the chip overall. The 6600GT on PCI-E is clocked at 500/1000, whereas the AGP version we saw from Nvidia is clocked at 500/900. Well, XFX have come through again as the gamers\' choice and have decked out their card with fully-functional 1000MHz memory, putting this card ahead of the rest of the 6600 pack. This is really going to be a fly-by feature, because the fundamental performance is exactly the same as the reference board that we tested. 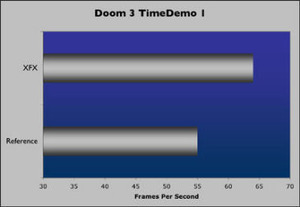 We know that the technology beats the 9800Pro, ATI\'s current equivalent on AGP, and we know that we can kick out around 60FPS in Doom 3 at 1280/2x/8x. For this article, then, we\'re going to take a look at the actual XFX card and run it through a couple of benchmarks to show its additional performance over the reference board. 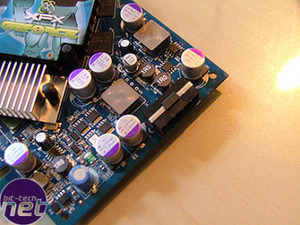 The board is decked out with an XFX-styled heatsink and the XFX-blue PCB. 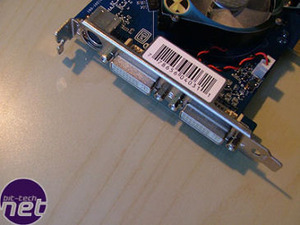 Being on AGP, it also requires a power connector. 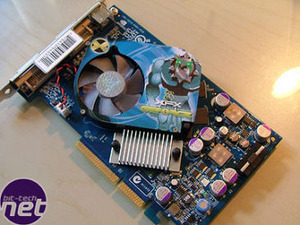 The 128MB of memory isn\'t cooled. The HSI bridge chip that Nvidia uses to turn this PCI-Express chip into an AGP chip is cooled by a rather large heatsink. 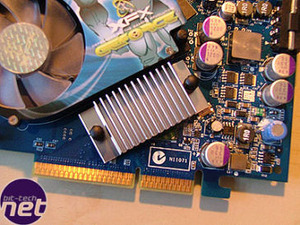 XFX equip this card with dual-DVI. Unlike PCI-Express 6600GT cards, this board lacks the SLI connector - no dual-card action here! The board comes bundled with X2-The Threat, Commandos 3 and Nascar 2004. As we can see, the extra memory speed does give this something of a lead over the reference product. 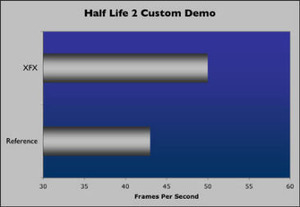 It\'s only a few frames per second, but it does make a noticeable difference to the smoothness of the demo. Our custom demo is something of a performance killer, taking place in the heart of City 17. The extra 100MHz on the memory clock gives the XFX board a clear advantage over the reference card and other stock-clocked 6600 boards. Back in November, we loved the performance of the 6600GT and nothing has changed. It still remains the best mid-range gaming card we can recommend on AGP, and the extra clock speed bump that XFX have given it is very welcome. We can easily recommend this card for all you guys that would love the cachet of a 6800Ultra but have to settle for something a little more affordable.